We’d love your help. Let us know what’s wrong with this preview of Der Weltensammler by Ilija Trojanow. To ask other readers questions about Der Weltensammler, please sign up. Ich weiß schon eigentlich, warum ich etwas gegen zeitgenössische deutsche Literatur habe. Irgendwas ist mit dieser Generation passiert: sie können einfach nicht vernünftig schreiben! wahrscheinlich hat sich in ihnen der Gedanke fest gesetzt: ein gutes buch muss kompliziert sein... von der gepflegten Erzählkultur, wie sie sich zum Beispiel die Angel-Sachsen erhalten haben, halten diese neuen deutschen Schriftsteller so gar nichts. Ich dachte, der Weltensammler wäre anders und ich beschloss dem buc Ich weiß schon eigentlich, warum ich etwas gegen zeitgenössische deutsche Literatur habe. Irgendwas ist mit dieser Generation passiert: sie können einfach nicht vernünftig schreiben! wahrscheinlich hat sich in ihnen der Gedanke fest gesetzt: ein gutes buch muss kompliziert sein... von der gepflegten Erzählkultur, wie sie sich zum Beispiel die Angel-Sachsen erhalten haben, halten diese neuen deutschen Schriftsteller so gar nichts. Ich dachte, der Weltensammler wäre anders und ich beschloss dem buch eine Chance zu geben. zum einen, weil er - wieder einmal - von der Presse hochgelobt wurde, zum anderen weil das Thema so spannend und das Cover so schön gestaltet ist. Es geht hier um den Britischen Offizier Richard Burton, den Mann, der sich wirkungsvoll dem Klischee des Britischen "Soldier Heros" in den Kolonien wiedersetzt hat. Anstatt sein Überlegenheitsgefühl auszuspielen hat sich dieser Mann angepasst, die lokalen Bräuche und Sprachen gelernt und war schließlich kaum noch von den Einwohnern zu unterscheiden. Es ist der Mann, der die Bücher Kamasutra und 1000 und 1 Nacht in den westlichen Kulturkreis brachte. es ist der Mann, der als erster Westler die heilige Städte Mekka und Medina besuchte. Alles sehr sehr spannend, allein, das Buch ist staubtrocken. Trojanow entscheidet sich drei Episoden aus Burtons Leben aus drei verschiedenen Sichtweisen erzählen zu lassen. Keine der 3 Episoden, ist annähernd spannend erzählt. die erste kann man lesen, die 2 und 3 wurden für mich zunehmend zur Qual. es ist spannend, dieser Stoff, aber das Buch ist es nicht! Der Schreibstil ist so zurückhaltend, dass keine Atmosphäre aufkommt. Die Dialoge so verwirrend - wer spricht hier??? - dass der Leser zunehmend entnervt kapituliert. Der britische Offizier Richard Burton bereist im 19. Jahrhundert Indien, Arabien und Afrika. Mit einer Mischung aus Camouflage und Mimikri taucht der Entdecker und "Meisterspion" in fremde Rassen, Kulturen, Sprachen und Religionen ein, absorbiert einfach alles aus der fremden Welt und liefert für die britischen Kolonialherren als Spion wertvolle Aufzeichnungen und Innenansichten. Meist lässt Burton sich von der Umgebung völlig emotional mitreissen und manchmal distanziert er sich mit seinem brit Der britische Offizier Richard Burton bereist im 19. Jahrhundert Indien, Arabien und Afrika. Wortgewaltig mit einem sehr blumigen komplexen Deutsch, so als käme unsere Sprache direkt aus 1001 Nacht, beschreibt Ilija Trojanow die fremden Kulturen, was dieses Werk wahrscheinlich nur für Leute mit deutscher Muttersprache und einer gewissen Liebe zum Fabulieren bewältigbar macht. Was mich aber dennoch gestört hat, sind die unzähligen Fremdwörter aus dem Indischen und Arabischen aus dem medizinischen Bereich etc., die zwar einigermassen in einem Glossar erkärt werden, durch die Häufigkeit auf den Seiten aber erheblich den Lesefluss stören. Sehr oft muss man nach hinten blättern oder ein Fremdwörterlexikon zu Rate ziehen. In diesem Fall hätten Fussnoten auf der Seite das Lesevergnügen und den Lesefluss erheblich erhöht und mich daran gehindert, doch einen Punkt abzuziehen. Dem Hauptkritikpunkt von vielen Lesern an dem Werk, dass eigentlich nix passiert, kann ich zwar zustimmen, nur er stört mich überhaupt nicht. Den Weltensammler - welch treffender Titel! - kann man als historischen kolonialen Road-Roman bezeichnen, der von der teilnehmenden Beobachtung fremder Kulturen und kritschen Auseinandersetzung mit Politik, Kultur, Philosophie und Religion lebt. Fazit - nicht für Jedermann - Keine Action viel Hintergrund und Beschreibung - "schwierige Sprache"
Literate and no doubt well-researched, I was still left somewhat disappointed. The book is divided into three important chapters in Burton's life: His years as a soldier in India, the daring Haj disguised as one of the faithful, and the trek in east Africa to discover the source of the Nile. But it still brings us no closer to Burton the man. One would be better off picking up one of the excellent biographies written about Sir Richard, i.e. : Burton by Byron Farwell; A Rage To Live by Mary Lovell Literate and no doubt well-researched, I was still left somewhat disappointed. A very interesting novel about Sir Richard Burton that focuses on three segments of his life: his time in British India during which he translated the Kama Sutra, his performance of the Hajj in Arabia, and his voyages in East Africa with John Speke to find the source of the Nile. In each case, the story is told not so much from Burton's perspective as from the local people of the areas with whom he interacted. In India this is his servant who is telling his story to a letter writer in order to g A very interesting novel about Sir Richard Burton that focuses on three segments of his life: his time in British India during which he translated the Kama Sutra, his performance of the Hajj in Arabia, and his voyages in East Africa with John Speke to find the source of the Nile. In each case, the story is told not so much from Burton's perspective as from the local people of the areas with whom he interacted. In India this is his servant who is telling his story to a letter writer in order to get a letter that will secure him a new position. The letter writer is so interested in the story that he draws out more and more details to publish the story on his own. In Arabia, the Turkish government questions the people who Burton traveled with on his way to perform the most sacred act of the Muslim faith, a visit to Mecca. None of the fellow pilgrims suspected he was British. The exploits in Africa are related by his guide who tells the tale to his neighbors years later. I hoped I’d like it bc it sounds so interesting but tbh it was really boring and a very slow read! I cannot give a book more than a single star when I could barely finish it and had to skip through several pages just to feel closer to the end. That said there are positive things to say about Der Weltensammler by Iliya Troyanov. For instance, I enjoyed the writing, and another thing was how difficult I found it to actually give myself completely to the novel, which is also a thing I dislike, but I think this might also be a positive thing, because the author wanted to write a book about how im I cannot give a book more than a single star when I could barely finish it and had to skip through several pages just to feel closer to the end. That said there are positive things to say about Der Weltensammler by Iliya Troyanov. For instance, I enjoyed the writing, and another thing was how difficult I found it to actually give myself completely to the novel, which is also a thing I dislike, but I think this might also be a positive thing, because the author wanted to write a book about how impossible it can almost be to identify oneself with another culture which might have been my problem. Did not finish the last few pages, I just stopped caring. I get why people like this book. There is a lot of cultural tension that can be translated into today multiculturalism and global society. Also the descriptions of Burton actually experiencing his travels are great, especially his Hadj and the connection to feelings of belonging to a Did not finish the last few pages, I just stopped caring. I get why people like this book. There is a lot of cultural tension that can be translated into today multiculturalism and global society. Also the descriptions of Burton actually experiencing his travels are great, especially his Hadj and the connection to feelings of belonging to a group. Why did the writer feel to interfere every few pages, with highly unrealistic and static conversations of people who where also there on his travels? THE COLLECTOR OF WORLDS. (2006). Iliya Troyanov. ***. Disappointing. I was looking forward to reading this novel based on the life of Sir Richard Francis Burton. 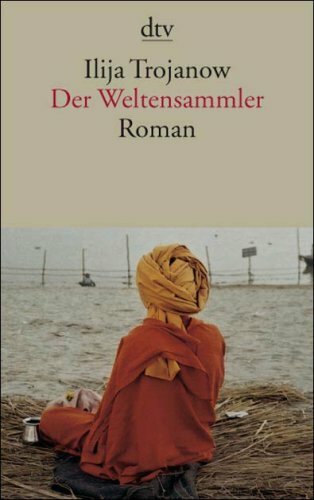 The author is a German writer, and this book garnered several prizes in his country and turned into a best seller. Burton is one of those people I’d like to go back in time for in order to meet. I am continually amazed at all he was able to accomplish, especially considering the lack of what we today consider standard amenities, e.g., el THE COLLECTOR OF WORLDS. (2006). Iliya Troyanov. ***. Disappointing. I was looking forward to reading this novel based on the life of Sir Richard Francis Burton. The author is a German writer, and this book garnered several prizes in his country and turned into a best seller. Burton is one of those people I’d like to go back in time for in order to meet. I am continually amazed at all he was able to accomplish, especially considering the lack of what we today consider standard amenities, e.g., electricity, radio, etc. Burton was an explorer, an archeologist, a master of over twenty languages, and a translator of many basic works from Hindi, Sanskrit and other languages. His list of translations alone should draw your respect. These included “The Arabian Nights Entertainment.” “The Kama Sutra,” and a variety of religious texts. His history of explorations in Africa with Speke to determine the source of the Nile revealed geography of Africa unknown to the world at the time. In all, he was a superman of his time. This novel turns out to be rather dull. The story of Burton’s life is told through the eyes of various people he came into contact with on his various travels. They really didn’t know Burton, but only provided descriptions of his actions within their spheres. With all of his activities, this book manages to soft peddle most of them. There is no excitement here. Although well written from a formal descriptive sense, the book does not come forth as either a novel or a biography. I found myself applying my “sniff” test. That test involves my reading up to 100 pages and deciding whether or not to go on. I didn’t go on. The Victorian age was the last great age of exploration, and Sir Richard Francis Burton was the greatest explorer of them all. His life beggars description; he was a spy, he spoke 22 languages (at least), he discovered the source of the Nile, he was the first European to make the pilgrimage to Mecca -- in disguise -- he was the first person to translate the Kama Sutra into English. And on and on. My favorite story from his life was the time in Somalia when he was attacked in the middle of the ni The Victorian age was the last great age of exploration, and Sir Richard Francis Burton was the greatest explorer of them all. His life beggars description; he was a spy, he spoke 22 languages (at least), he discovered the source of the Nile, he was the first European to make the pilgrimage to Mecca -- in disguise -- he was the first person to translate the Kama Sutra into English. And on and on. My favorite story from his life was the time in Somalia when he was attacked in the middle of the night by a hostile tribe. He was outnumbered something like 150 to 1, and took a spear through his mouth, which he pulled out, and threw back at his assailant, killing him. He put the entire native army to rout virtually single-handed. They thought he was a demon, since the spear through the mouth didn't kill him. He helped the impression by cursing them in their own language as he fought; it pays to study foreign languages. Burton is almost forgotten today, unlike Livingstone, and Shackleton, and Peary. It's unfair; his life puts James Bond and Batman to shame. In part it's because he wrote copiously about his exploits, but most of the books are out of print or hard to get today. They are Victorian in style and manage to make his life-and-death exploits seem earnest and even a trifle dull. Reading this book was hard work. Firstly the German writing style is difficult. Secondly there was no drama. The story gave only a ghostly sketch of Sir Richard Burton, who somehow did not come to life. No doubt that the man was a fascinating character, a linguist and a traveller who was the first westerner to go on pilgrimage to Mecca. A man who translated the Kamasutra and spoke so many languages, and lived so many different lives. The book only gives glimpses of his personality through the re-t Reading this book was hard work. Firstly the German writing style is difficult. Secondly there was no drama. The book only gives glimpses of his personality through the re-telling of his travels from three different viewpoints: The narrator of the first part is Burton's servant in India, the second part is narrated by officials in the Ottoman empire investigating his trip to the Islamic holy cities and the third part is narrated by the African guide who accompanied Burton and Speke on their trip in East Africa to find the source of the Nile. Als ich dieses Buch zum ersten Mal aufschlug, war ich durchaus begeistert. Die Handlung kommt faszinierend vor: ein britischer Abenteurer erlebt Kulturen von Indien, Arabien, und Afrika im 19. Jahrhundert. Er ist ein sprachbegabter Wissenschaftler und Forscher, der keinerlei Angst davor hat, unter dem hiesigen Volk zu leben und von ihrer Weltanschauung zu lernen, ganz im Gegensatz zu den anderen Europäern, die sich zu dieser Zeit außerhalb von Europa aufhielten. Diese exotische Geschichte sollte Als ich dieses Buch zum ersten Mal aufschlug, war ich durchaus begeistert. Die Handlung kommt faszinierend vor: ein britischer Abenteurer erlebt Kulturen von Indien, Arabien, und Afrika im 19. Jahrhundert. Er ist ein sprachbegabter Wissenschaftler und Forscher, der keinerlei Angst davor hat, unter dem hiesigen Volk zu leben und von ihrer Weltanschauung zu lernen, ganz im Gegensatz zu den anderen Europäern, die sich zu dieser Zeit außerhalb von Europa aufhielten. Diese exotische Geschichte sollte also einfach packend sein, so voll von Personen und Orten ist sie, von denen man nur selten erfährt. Doch ist sie nicht. Ich kann den Grund nicht genau ausmachen, aber Der Weltensammler ist langweilig. Trojanows Stil schafft es irgendwie, voll uninterresant zu sein, und dazu verschafft er zwischen dem Leser und dem Lesestoff einen Abstand, der für mich kaum zu überwinden war. Als gäbe es einen Schleier, der mich erfolgreich behindert hat, in die Geschichte einzudringen und mich für dieses Buch zu begeistern. The fact that it took me so terribly long to read this book should speak for itself I guess. It was not a bad book, it was even interesting at times. It was just difficult for me to keep track of the lines: who said what, where are we now, where is the main character going (HELP who IS the main character now was more than once the question...). The subject: a fictive / realistic story about the life and adventures of Richard Burton is good enough. I liked the passages about him, what he was doin The fact that it took me so terribly long to read this book should speak for itself I guess. The subject: a fictive / realistic story about the life and adventures of Richard Burton is good enough. I liked the passages about him, what he was doing, thinking, where he was traveling. I just got very confused by the different story tellers, that all talked about Burton too. Der Weltensammler war ein durchaus kulturell interessantes Werk; Trojanow hat keine Mühe gescheut, Richard Burton's Lebensgeschichte im Orient Mitte des 19. Jahrhunderts möglichst lebendig und vielfältig zu erzählen. Allerdings verstrickte sich der Autor in dermassen abwegige und langatmige Dialoge, dass es auch einem konzentrierten Leser nicht gerade einfach gemacht wird, der Handlung zu folgen. Eine Handlung, die zusätzlich eher dahinplätschert, sich manchmal in Details verliert und auf Rückbl Der Weltensammler war ein durchaus kulturell interessantes Werk; Trojanow hat keine Mühe gescheut, Richard Burton's Lebensgeschichte im Orient Mitte des 19. Jahrhunderts möglichst lebendig und vielfältig zu erzählen. Allerdings verstrickte sich der Autor in dermassen abwegige und langatmige Dialoge, dass es auch einem konzentrierten Leser nicht gerade einfach gemacht wird, der Handlung zu folgen. Eine Handlung, die zusätzlich eher dahinplätschert, sich manchmal in Details verliert und auf Rückblenden fokussiert ist. Ausserordentlich gefallen hat mir aber der Erzählungsteil über Burton's Reise nach Medina und Mekka, als er, getarnt als Muslim ('Sheikh Abdullah'), die zermürbende Pilgerreise des Hadj (Hadsch) auf sich nimmt. Die lebendigen Beschreibungen der muslimischen Kultur, der religiösen Zentren, der alten Traditionen und den vielen Begegnungen zwischen Menschen aller Hautfarben war sehr bereichernd. British Empire: he underlines those contradictions by switching from the story as experienced by Burton and the story as recalled by those whose cultures he collected during his life. This will bear repeat readings. Просто не се справих с тази книга. Опитвах няколко пъти, но четенето й никак не вървеше. Не заради съдържанието, колкото заради формата - не знам дали заради автора или заради преводача/защото оригиналът е всъщност на немски език/, но буквално се спъвах на всяко второ изречение. Езикът не ми хареса, конструкцията на изреченията и абзаците - също. Четях я мудно, трудно. А може би подходих към книгата с твърде големи очаквания. Или не избрах точния момент за четенето й.
Темата е много интересна- доколко можем да се слеем с различните от нас, да се претопим в чуждото, в" другото". В същото време книгата представлява интригуващ опит за психологически портрет на една изключителна личност. Сериозна писателска заявка. :-)) Обаче не можах да я дочета. Самият начин на повествование ми беше монотонен и в един момент просто се почувствах блокирана да продължа. Въпреки това, впечатленията ми от автора са много добри и смятам да опитам с други негови книги в бъдеще. Absolutely one of the best novels I've ever read. It's about Richard Burton's travels through India, Asia, and Africa. Well crafted, brilliantly written - a real pleasure to read. The middle part is a bit challenging but well worth it by the time he gets to Africa. Highly recommended for the serious reader. as I really want to read more about Burton. Literarische Glanzleistung, die sich irgendwo zwischen Fakt und Fiktion bewegt und mich zurücklässt mit der Frage, ob wir im Leben unsere Rolle gänzlich verändern können oder doch immer WIr bleiben? This book is beautifully written in English and so the translator must have done an amazing job. The structure is different, fresh and quirky, but the story is lyrical and entrancing, Sehr gut! • Mit 21 Jahren geht er nach Indien und arbeitet für die East Indian Company. •	Mit 21 Jahren geht er nach Indien und arbeitet für die East Indian Company. •	Als einer der ersten „westlichen“ Menschen nimmt er an einer Pilgerfahrt nach Mekka teil. Er gibt sich als Muslim aus und bringt seine Erlebnisse in Buchform heraus, was in islamischen Gesellschaften Bestürzung hervorruft, die wieder für eine Beschreibung der Person Burtons herhalten. •	Im dritten Teil des Romans beschreibt Trojanow, wie Burton in gefährlichen Expeditionen versucht die Quellen des Nils und die großen zentralafrikanischen Seen zu finden. Großartig werden hier die Strapazen der abenteuerlichen Reise durch den Busch beschrieben. Burton passt sich immer seiner Umgebung an, indem er die jeweilige Sprache lernt und auch die lokale Religion annimmt. Das kürzeste Kapitel ist das letzte, das sich „Offenbarung“ nennt und in dem das Sterben Burtons aufgezeigt wird. Er lebte in Triest mit seiner afrikanischen Frau, die er während einer Expedition gekauft hatte und die sehr gläubig wurde. Als solche drängte sie ihn auch zum katholischen Glauben und versuchte ihm eine Erleichterung seines Gewissens durch eine Beichte zu verschaffen, die so skurril ausfällt wie sein ganzes Leben. In diesem Buch steckt sehr viel Recherchearbeit, damit es Kulturen vermitteln kann, die doch sehr gegensätzlich sind. Having expressed scepticism about the effectiveness of the well-researched historical novel and how character may be subsumed beneath the detail and the story, I find myself declaring that this historical novel is one I enjoyed much more. In part this is simply because it may be read as a Boys’ Own adventure of manly exploration, risk-taking and derring-do, which I’m a sucker for. The author also says that although he is inspired by the life and works of Sir Richard Burton (not the actor), he doe Having expressed scepticism about the effectiveness of the well-researched historical novel and how character may be subsumed beneath the detail and the story, I find myself declaring that this historical novel is one I enjoyed much more. In part this is simply because it may be read as a Boys’ Own adventure of manly exploration, risk-taking and derring-do, which I’m a sucker for. The author also says that although he is inspired by the life and works of Sir Richard Burton (not the actor), he does not ‘hesitate to depart from – or to elaborate on the gaps within – the historical record’. In this respect, it is simply taking history as a starting point and is not overly concerned with verisimilitude, as I felt ‘The Miniaturist’ to be. He also says, ‘All individual lives are mysterious... This novel is intended as a personal approach to a mystery [presumably, Burton’s character] rather than as an act of definitive revelation.’ Thus the emphasis lies firmly on exploration of character (entirely suitably for Burton the explorer of the ‘Worlds’ of the title, of religious experience, and of languages) which suits me well. The novel is written in three parts: the first is an account of Burton’s time in British India in the Indian Army; the second is set in Arabia, and concerns Burton’s completion of the Hajj which, as a non-Muslim, was a sacrilegious act; and the third looks at Burton’s expedition with John Speke to find the source of the Nile in East Africa. I found that this long novel maintained a steady pace, neither rushing nor flattening in interest towards the end. That made it enjoyable. The narrative consistency was supported by a variety of narrators. The Indian section has a third person narrator as well as a character called Naukaram, who was Burton’s Indian servant who accompanied him back to England, but who was then sacked. Naukaram is telling his story to a scribe – a lahiya – in order to have a document with which he may seek redress, but as his narrative proceeds, it becomes evident that the lahiya has ambitions of turning it into a literary masterpiece which he may claim as his own – a neat trope, perhaps for what Troyanov himself is doing. The Arabian section has, once again, the third person narrator and then a series of narrators who are figures in the Ottoman Empires bureaucracy and governing bodies who are trying to work out if Mirza Sheikh Abdullah really is Richard Burton as they think he is. In this sense, the adventure story also becomes something of a novel of detection. And the third part, set in East Africa, has the third person narrator again and introduces us to Sidi Mubarak Bombay who, as an older man, is telling his version of the events of the Burton-Speke expedition to his friends in Zanzibar, interrupted from time to time by his wife who mocks his boastfulness, but who secretly adores him. Thus there are several characters who emerge strongly through the individuality of their narrations, and Burton’s character is addressed, Rashomon-style, from several viewpoints. I found this made the novel very enjoyable. As did Burton’s individuality, often kicking against Victorian social expectations, learning strange languages until fluent, learning about Islam and the Islamic world well enough to make his way to Mecca – if not quite undetected, then safe in his mastery of language, religion and customs – and learning the art of love from his Indian mistress. I was pleased that little was made of his translating the Kama Sutra and the Perfumed Garden, and more focus was placed on his remarkable personal achievements, personal (if unconventional) integrity, and what might have been the forces that drove him. I also remember seeing a TV programme about his East African expedition with Speke in which Speke was presented as driven to the point of ruthlessly excluding Burton from the discovery of Lake Victoria. Troyanov doesn’t see it quite like that, which I found challenged my prejudice refreshingly, and anyway, in Rashomon style, who really knows the truth of things? Nevertheless, I did enjoy what I took to be the confirmation of one prejudice, and that is the indiscriminate way African ‘explorers’ shot anything and everything. (Speke does this as a matter of course, much to Burton’s mystification: but Speke is equally mystified by Burton’s obsession with writing his journal.) I remember the jolly Coral Island boys bagging anything that moves in Ballantyne’s ‘The Gorilla Hunters’. They also seemed to have the pockets of boy scouts, producing useful bits of twine which, in the middle of the forest, they just happened to have about their persons. But that’s another novel, and the more realistic Troyanov avoids any sense of lauding the world-owning and -controlling jingoism of Ballantyne’s take on Empire. Ilija Trojanow has a very distinctive and challenging writing style, which brought him a long list of literary awards. The Collector of Worlds is not every reader’s cup of tea because of its complex form, narrativics, a high register language usage and a huge glossary with foreign words from many different cultures. At the beginning of the novel I was really struggling with the sentences but just after some chapters Mr. Trojanow succeeds in hooking me into Sir Richard Burton’s story. I gave the n Ilija Trojanow has a very distinctive and challenging writing style, which brought him a long list of literary awards. I gave the novel four stars for two main reasons. 1. For an e-reader it’s very uncomfortable to turn the pages in order to use the glossary at the very end of the book. It would be really better to use footnotes for the purpose. 2. The second reason is actually a suggestion to make the novel more interactive since its genre is not only biographical but also a road novel. You could take the reader on fascinating adventures along with Sir Burton if you include the maps of the travels and expeditions. It not easy to understand the hype this one generated when it came out. No doubt the story of Richard Burton is amazing. But the couple of pages that Borges gives us on this man are infinitely more satisfying. The language is rather lame. The literary trick to have chapters describing some events with chapters of dialogue between one of his companions and some interrogator at first seem clever but becomes tiresome after a while. Also, it distracts. We never really learn to care for Burton. Maybe t It not easy to understand the hype this one generated when it came out. No doubt the story of Richard Burton is amazing. But the couple of pages that Borges gives us on this man are infinitely more satisfying. Ilija Trojanow (bulgarisch Илия Троянов) ist ein deutscher Schriftsteller, Übersetzer und Verleger bulgarischer Abstammung. Ilija Trojanow (Bulgarian: Илия Троянов) is a Bulgarian-German writer, translator and publisher. “Слънцето трябва да залезе и да се издигне месецът, докато Кайро се отвори като мида и се разкире красотата му в силуетите." "Някои палми накланят глави сред вятъра, нощта е чудна във всеки отрязък, благодарение на собствените и на чуждите духове,а той, самотният пътешественик, не може да си представи мръсния, припрян, пронизителен и потискащ живот през деня." "Понякога напращелият град се уригваше. Всичко миришеше на разложения от стомашни сокове. Накрая на улицата лежеше полусмялно слепоочие, което щеше скоро да се разтече. Една лъжица загребваше от месестата част на презряла папая, на връщане от пазара петите не излъхваха пот,а кориандър. Той не знаеше какво го отвращаваше повече, морският бриз, по време на отлива, носещ гнилия дъх на водорасли и плажни медузи, или уханията на мюсюлманската закуска от вътрешности на коза, запържвани върху малки печки. Пътеката на човечеството бе постлана с коварни изкушения." "Най-непоносими са шумовете: гукащите гълъби в отворения шкаф, дрезгавогласни и свадливи от любовно усърдие, огромните котки, които минават през скелето на покрива и ридаят от ненаситна разгоненост." "Те рецитираха първата сура, фатихах, насочили длани към небето, сякаш искаха да уловят някакво благословение, което слизаше от небето върху кораба." “Тази поразителна неразбория, която звучи така, сякаш думите са били хвърлени с прашка. Посред безумието. Затова забраних всякакво говорене.